After an impressive debut with DADDY COOL(read my review) in 2009, director Aashiq Abu is back with his new movie SALT N' PEPPER with no big names in lead. Archeologist Kalidasan(Lal) is a foodie staying along with his cook Babu(Adv.Baburaj), his nephew Manu(Asif Ali) & a tribal guy Mooppan who was brought to his house to learn about new dishes & its making. Maya(Sewtha Menon) is a dubbing artist in film industry staying as paying guest in a beautician's(Kalpana) home along with Meenakshi(Maithili). Kalidasan & Maya meets through a call ordering DOSA, which was a wrong number. Kalidasan & Maya falls in love through chat without seeing each other. At a point, they decided to meet. Kalidasan sents Manu instead of him & Maya sents Meenakshi as they were really introvert & a bit complex. Whether Kalidasan & Maya unites is the rest of the story. Lal as Kalidasan is the show stealer. The character was safe in his hands. Small movements, be it after tasting a food or after cutting the call when Swetha cries thinking about her mother, Lal was too good. A tailor-made role for him. Adv.Baburaj as Babu the cook with some feminine nature is a change for him & audience. His oneliners & certain gestures will make us laugh at parts. But comparing to his role in DADDY COOL, its nowhere. Asif Ali as Manu had nothing much to do. He did an ok job & improved in his dialogue delivery. 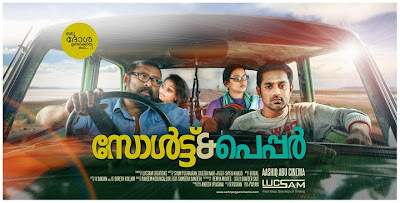 Swetha Menon was a miscast, atleast for me. ROHINI was the best person to play that role. Also Bhagyalakshmi's dubbing was not matching for her. She did an ok job. Mythili too had nothing much to do. In her intro scene itself, she proved that she's not a heroine material with bad expression. Kalpana had nothing to do in her bad makeup.Tribal character Mooppan was just a showcase material. Archana Kavi & NanduLal was fine in their cameo. If someone tells you like this is a feel-good romantic movie, then you can find only one such sequence in this movie. Its not Lal-Swetha or Asif-Mythili, its none other than VIJAYARAGHAVAN. Though the character makes us remember the type of characters which Nedumudi Venu played in 80s, Vijayaraghavan's way of performance & dialogue delivery & smart dialogues in script makes you tell that this is the feel-good lovestory. Music by Bijibal fits to the mood of the movie. Though songs are speedbreakers & seems unwanted in a movie like this, the editing of "Premikkumbol" song makes it watchable. "Kaanamullal" was an unwanted one. The final song "Aanakallan" by Avial band was a disaster. Are you the same Aashiq Abu who directed "Daddy Cool" song in that movie end titles. Bad editing results in an headache only. This song totally disturbs the mood of the audience which created till before that..
After TRAFFIC, Shyju Khalid makes an impressive work at parts. The opening forest sequence, the car crossing the bridge, a set of such visuals was impressive. But lacked the presence in the movie. Editing was good at parts & boring too at parts. The opening sequence & some scenes makes us think why so lengthy. Editing could have been crisper. Art direction needs special mention. I'll rate this film above DADDY COOL script wise & below DADDY COOL direction wise. Script is by Shyam Pushkar & Dileesh Nair. They told a simple story on the backdrop of food. But unfortunately the script disappoints at times. The movie's first half was en engaging one. But problem is with second half. The climax is already known to audience. The scenarists failed to make it engaging with nice twists & turns or some feel-good sequences. Instead the script gave importance to Asif-Mythili sequence which looks totally out of place. Though presented the simple theme in new package, the film is not free from cliches. Mythili falls in love with Asif once he helps her & admits her in hospital following a duet. Also an irritated romance failure hero showing his anger towards his beloved ones. It is the director who gives the film another dimension. Aashiq Abu started the movie very promisingly & differently with fresh title cards. But the direction loses at many parts. Even traces of DADDY COOL was there here too. Watch out for the scene how director tells us that the characters were fined a Rs.3000 & what for. It made me remember Antony Simon's suspension scene in DADDY COOL. In scenes with content, there lacks visual beauty & viceversa. On the whole, a decent work. Though the movie was given the tagline "Oru Dosa undakkiya Kadha"(A story which is made by a DOSA), not only that Dosa the entire food stuff which was used wantedly & unwantedly for proceedings in first half was missing in second half. Climax was another big disappointment, neither the script writer nor director provide a surprise or freshness. Also once the shooting location with flowers is shown, people started telling like this will be the climax shot. Aashiq Abu is a director with talent, but his work is not at all consistent. Hope from next time onwards he'll overcome this. People were booing & shouting & passing comments about Prithviraj when Swetha's opening sequence was a la'CLASSMATES sequence dubbing & later the same actor speaks about fans flex work. Claps were there for Mammootty & Kunchacko Boban in the opening titles.Watch it! !